Bundesliga | Bayern Munich beat RB Leipzig on penalties - DFB Cup Second Round - as it happened! Bayern Munich beat RB Leipzig on penalties - DFB Cup Second Round - as it happened! Jupp Heynckes' hopes of guiding Bayern Munich to another treble remain intact after the record German champions beat ten-man RB Leipzig on penalties in an absorbing DFB Cup second-round tie at the Red Bull Arena. A hugely intense encounter produced a plethora of chances for both sides in an exiting first-half. The dismissal of Naby Keita for a second bookable offence after the break threatened to interrupt the flow, yet Leipzig refocused to take the lead. After Jerome Boateng was adjudged to have fouled Yussuf Poulsen in the area, Emil Forsberg calmly stroked in the penalty for 1-0. Shorty afterwards, Boateng’s superbly chipped pass found Thiago in space and the Spain international duly headed the equaliser. 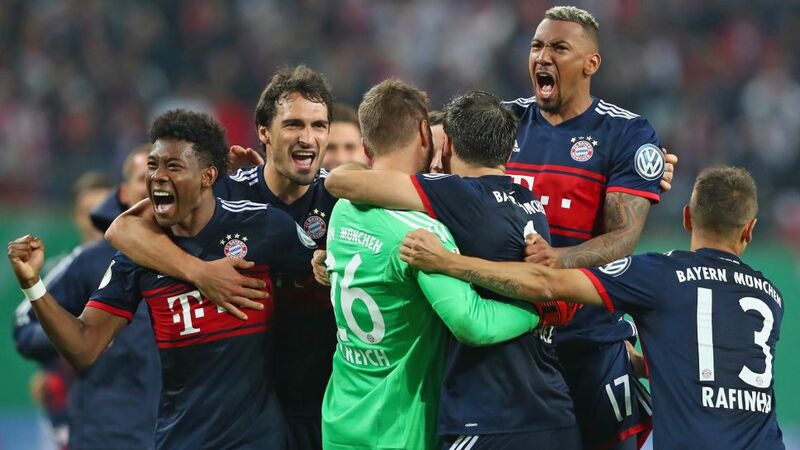 The teams couldn’t be separated thereafter and following a perfect nine penalties in the ensuing shootout, Sven Ulreich saved Timo Werner's spot-kick to send Bayern through. This was the first meeting between these two sides in the DFB Cup, and only the third ever.Bayern won both Bundesliga meetings last season: 3-0 at the Allianz Arena and 5-4 in Leipzig.Heynckes' final game as Bayern coach before his return earlier this month came in the DFB Cup final, with a 3-2 win over Stuttgart in Berlin's Olympiastadion completing a treble.Heynckes had never faced a team from Leipzig as a coach.Bayern's Franck Ribery has lifted the DFB Cup five times – only Cologne's Claudio Pizarro (six) has won it more often among players still in the Bundesliga.Leipzig's best performance in the DFB Cup was a place in the last 16 in 2014/15.